Rufi Global City, a housing project initiated somewhere around 2003-4 in Karachi, Pakistan is yet to be handed over to the plot owners even after more than 12 years of starting. The builder has been promising the possession to allottees since 2008 after getting full payments from them. Till date there is no final date from the developer apart from the usual excuse of lease being on hold. Please LIKE the above Facebook page for interaction. The page is about the individual owners of apartments booked for the project of Al Khaleej Towers by Al Khaleej Builders and Developers. The project is long due handing over as of now and under construction since 2007. This forum will give the genuine investors and buyers a platform to voice out their concerns regarding all kind of issues being faced by the builders including the delay in handover, charging extra money etc.. This forum can also be helpful for resellers for this particular project. Please like the page for regular updates plus mention your concerns on the forum. Buy and sell discussion of Al Khaleej Towers should be made private between members once linked properly. Finally, the conservative emirates realized the diversification effort initiated by neighboring Dubai and takes the first step towards offering properties to investors from outside GCC bloc. Following Dubai’s footsteps, most other emirates already offers the opportunity for expats to buy properties within UAE. Sharjah was the exception so far. Its been rumored due to Saudi influence the rulers were hesitating to bring in the law in order to keep Sharjah’s Islamic values intact, however, capitalism wins eventually. Anyhow, it is a very welcoming move and a great opportunity for those who missed Dubai’s property bandwagon. As Dubai’s property market has seen its good and bad times, it has pretty much consolidated now, and unless there is a major regional conflict, it will only improve hereafter. Sharjah can learn both from Ajman and Dubai to this date. Ajman being highly adventurous and ambitious made a plight to fly as high as Dubai in last decade, however, failed primarily because of recession and partly because of fundamentals. Ajman however, now is recovering with rest of the world as well as UAE in general. The other small emirates of Fujairah, RAK and Umm al Qwain are doing whatever they can in their own capacity but still has a long way to go. Abu Dhabi on the other hand is a dynamic economy itself primarily because of oil wealth and now due to diversification in real estate and tourism. So the comparison of Abu Dhabi does not fit either with Dubai or Sharjah. Moreover, Abu Dhabi is also not a close neighbor of Dubai as Sharjah is, due to which Sharjah directly gets impacted with any positive or negative sentiments in Dubai. Getting back to the recent law passed for Sharjah where expats holding UAE residency can buy properties in selected location on leasehold basis for 100 years. It should be noted that the news is still maturing and details are coming in, however, it is known that the first location where the leasehold is offered is strategically located on Emirates Road close to Dhaid Interchange and only 10 KMs away from Sharjah’s international Airport. For someone living and working in Dubai and aspire for quality affordable living, the aforementioned location has already raised the eyebrows. The location is perfect to travel to Dubai on freeways and at the same time away from crowded Sharjah’s city center. The project is named “Tilal City” and helmed by Tilal Properties, a new joint venture between Sharjah Asset Management and Eskan Real Estate Development. The project’s completion date as of now is fixed on end of 2017. The project, will comprise 1800 land plots. Split into five zones, it will provide high-quality, affordable housing for 65,000 residents in apartments, villas and townhouses. Tilal City will also include commercial, office and retail space as well as multi-use community facilities, schools, mosques and landscaped open areas. With rising cost of Dubai properties and better opportunities in Dubai while comparatively low cost of living in Sharjah people normally choose to live in Sharjah and work in Dubai. However, many people are reluctant because of travel time between Sharjah and Dubai specially during peak hours. The strategic location of Tilal city will ensure that the travel time to Dubai remains less while affordable better quality of properties are available. It makes sense as of now to invest in Sharjah, not only because Sharjah itself is growing and has diverse economy based on industry and tourism, but primarily because of proximity to Dubai, this kind of option was never available. The GCC bloc has been a magnet for all kind of workers from white to blue collars from all over the world because of tax free income and low cost of living compared to the western countries (although the cheap cost of living is now just a myth). Geographically, South Asian countries like Pakistan, Bangladesh, India, Nepal etc are close to GCC countries resulting the workers from these places fascinates to the opportunities due to rapid growth of the region and generous government spending to modernize national infrastructure. Due to oil exploration and now for the purpose of diversified economy, spending on infrastructure has been the top reason for jobs creation in GCC region which comprises of Saudi Arabia, Qatar, UAE, Oman, Bahrain and Kuwait. The region also enjoys the stability and relatively better rule of law compared to South Asian countries. The expats which come to work in these countries mostly consist of construction workers and other laborers from South Asian countries. However, white collar workers are also present in large numbers which includes bankers, engineers, doctors, businessmen etc. The aim of any expat worker in a foreign land is to make money and make money rather quickly as none of the GCC countries provides permanent residence and the only way to survive in there is either with employment or business. The expat workers send money back home to support the families and investments. 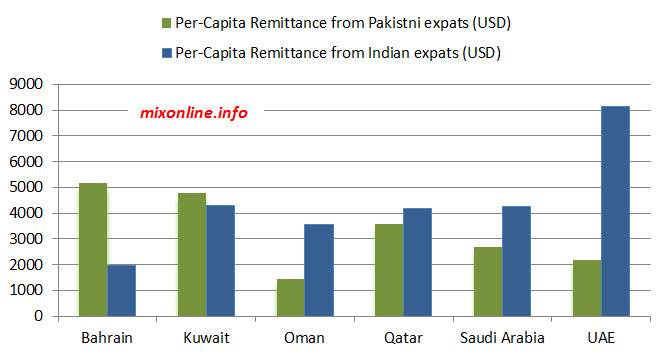 Indian and Pakistani expats combined will exceed even the 50% of total population of a country like UAE, hence it will be interesting to see the trend of remittances sent by the citizens of these countries back home as a comparison. – Remittance data for India is not published by Reserved Bank of India (RBI), hence various sources were consulted to get accurate data as much as possible. – There is no published authentic records of expat population from India or Pakistan and even from the hosting countries, the figure is also changing rather quickly so best sourced data in the particular time domain is taken. – All derived data based on best sourced data can be slightly skewed but gives an overall picture. However, the data inaccuracy may not deviate +/- 10% at max. According to SBP’s declaration of remittance to Pakistan, the top country for home remittance is USA with last year’s remittances reaching 2.46 billion USD while KSA stands on the second number where remittances accounting to almost 2.2 billion USD. Interestingly although as the Chart 1 shows KSA being the top remittance originator for Pakistan, Bahrain has the best Per Capita for remittance probably because of tiny population of expats there. However, India although have more expats in KSA but as can be seen from Chart 2, the per capita remittance from UAE to India is beating all peers. 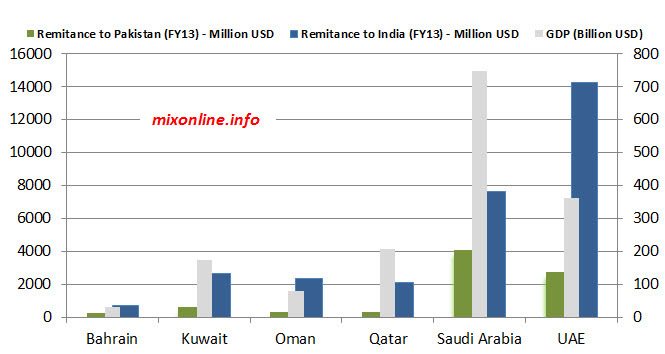 Indian per capita remittance touches 8,000 USD (29k AED) showing the quality of Indians working and earning in UAE are not only better off than other GCC countries but even much better than their Pakistani counterparts. This spread is further confusing when we look at the Indian domestic per capita income of 5,777 USD and Paksitan standing at 4,699 USD. 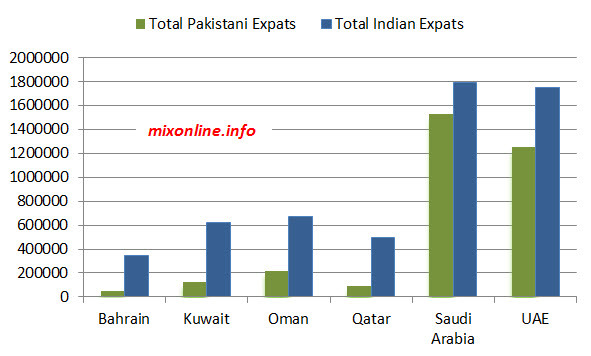 Chart 3 indicates towards the expat Pakistani and Indian population as a percentage of total population in the country. Here, UAE is heavily occupied by the two countries, infact a total of more than 55% of population living in UAE hails from the two South Asian countries. 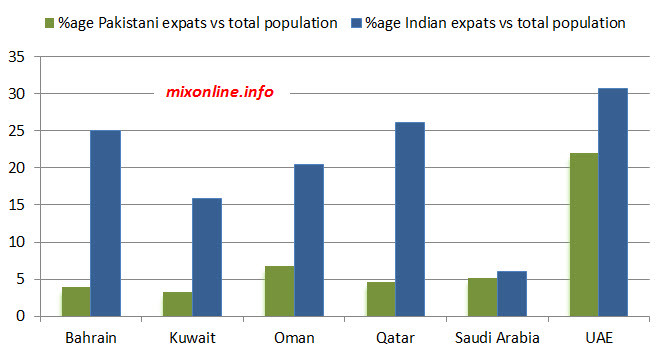 However, despite in large numbers, the expats from India and Pakistan are still in small percentage if compared with KSA. The reason is the Saudi Arabia’s large local population itself. The next two charts compare the remittances sent to Pakistan and India VS the GDP and total population of hosting country. Showing the existing potential in other countries which has been shown already by UAE. Here it must be remembered while comparing India and Pakistan in numbers, Pakistani is yet a small country as compared to India. India is six times bigger than Pakistan in population and if we consider that, the number of Pakistanis residing in GCC countries are in higher proportion, although the per capita remittance does not show a rosy picture for Pakistan specially in UAE. 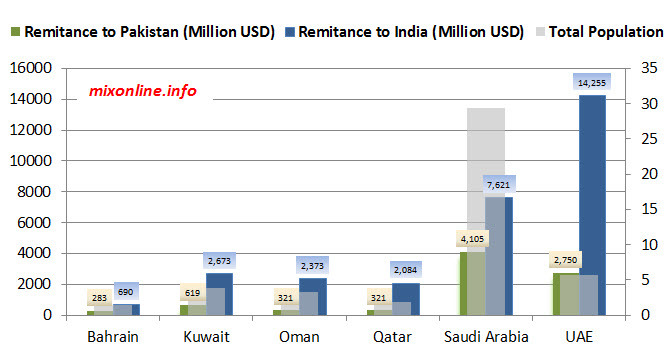 There could only be 2 reasons of low per capita remittances from Pakistan as compared to India. Either Indians are actually earning a whole lot than their Pakistani counterparts, or they are saving more to send back home. The first narrative or Indians having higher earnings is slightly supported with high numbers of Indian businesses which are having heavier weightage than mostly professional Pakistanis. However, living in GCC countries it has been noted that Indians are better in saving money and living a frugal life style compared to their Pakistani counterparts hence supporting the statistics. As we move into the final day of Scottish independence referendum, it has to be noted that the mood in whole of the UK is pretty calm and serene (as much as its use to be on any other day). This is a historical event, regardless of the outcome of vote. Who would have thought the British Raj will see a day when a tiny piece of land just adjacent to mighty England will ask for its own right in the form of independence, the same British Raj which was spread all over the world such that the sun never sets in the empire. Regardless of the circumstances which has caused such a huge event happening in Scotland, none of the serious politicians has ever said that the independence of Scotland will be over their dead body or the independence will require bloody revolution. One of the world’s most powerful country has not been able to suppress the will of people. Similar separatist movements are on going in countries like Canada and Russia. If the state is in constant state of denial for the rights of people, these indigenous moments will keep on shaping. Even the best of western world is still divided on linguistics and ethnicity, example being Canada/Qubec but in no way the state persecutes its own people for keeping difference of opinion. Framing the Scottish referendum over to the situation in Pakistan, it shows very interesting picture. The referendum in Scotland does not allow anyone else from UK to vote into it, even the Scots residing in England won’t be able to cast their votes strictly speaking. 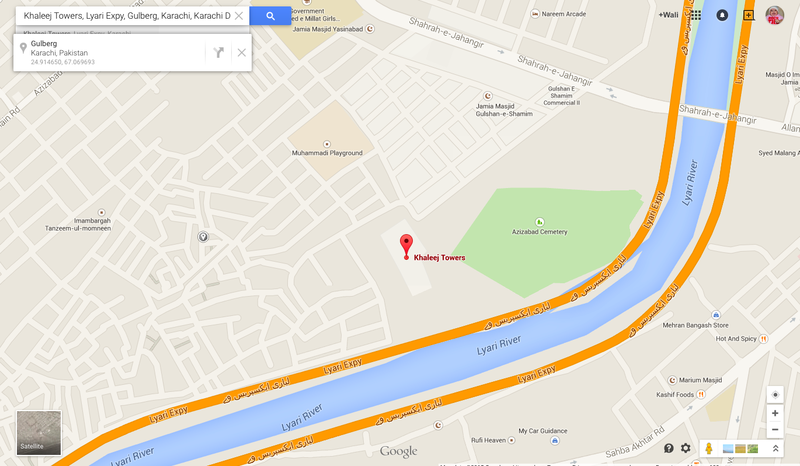 So its all about Scots residing in the region, however, lets take an example of Karachi within Pakistan. For Karachi and adjoining region to be declared as a province, first the upper and lower house of National Assembly needs to approve with 2/3rd majority and than the Sindh Assembly needs to approve the split with same kind of majority. This does not take into account what the people of Karachi actually wants. With total absence of governance within particularly the city and generally speaking for Sindh, there is no ray of hope with the democratic system which is in place currently. The so called democratic government and politicians violates the constitution every day by not holding local government elections even after the amendments which makes it mandatory to hold local bodies election now. Its been seven years that we in Pakistan are living without our basic civic right of having a local devolved government. The landlords of provinces like Punjab, Sindh, KPK do not want the system to be implemented which will devolve the power to common man and challenge their unlawful authorities. In this whole scenario since last year’s election, the worse part is played by revolutionary Imran Khan. I will say it as worse because he was the only man who was considered to be honest and thought to be man of his words. However, having ruled the province of KPK now for 1.5 years, he is yet to deliver on local government system and it is no where in sight so far. As for the other provinces, the rulers are already proven to be corrupt politicians making more and more money and getting more and more rich by each passing second in power. The frustration mounting because of absence of local government system from the country specially for Karachi which contributes 70% of taxes for the country and yet deprived of basic rights can become a giant movement. The precedence set by Imran Khan with the sit-ins and eventually getting the government on negotiation table with getting even higher gains than initial demands is dangerous. Considering this if request for local government elections by Karachi’s muscle political party as per the constitution is not honored, the only way forward would be sit-ins, and everyone knows there are parties more organized and with more street power than the PTI and their “dharnas” will create more impact than the ones going on currently. If that happens, I think the gain will not only be the local government election, but far higher. Scots are just an example here, not to be taken seriously in context of overall situation of Pakistan. Basically, Comparing Doha with Dubai is like comparing apples with water melon. Which looks pointless, however there are many aspects one has to take under consideration for a comparison sake of personal preference. It has to be clearly said that if someone is comparing Doha and Dubai or for bigger horizon Qatar and UAE in general for tourism point of view, UAE takes the lead by any standard. So the following write up is only for those who are aspiring work and has a choice to move either to Doha or Dubai (Qatar or UAE) in general. After the initial post on Karachi cell phone snatcher a couple of weeks back, local media finally got attention and the story got broadcasted almost as it is on a popular news channel ARY NEWS. The updates on this case are not very encouraging on ground as of today. the criminals photos are all over the internet and mainstream news channels, with a police report also registered, but so far no progress.